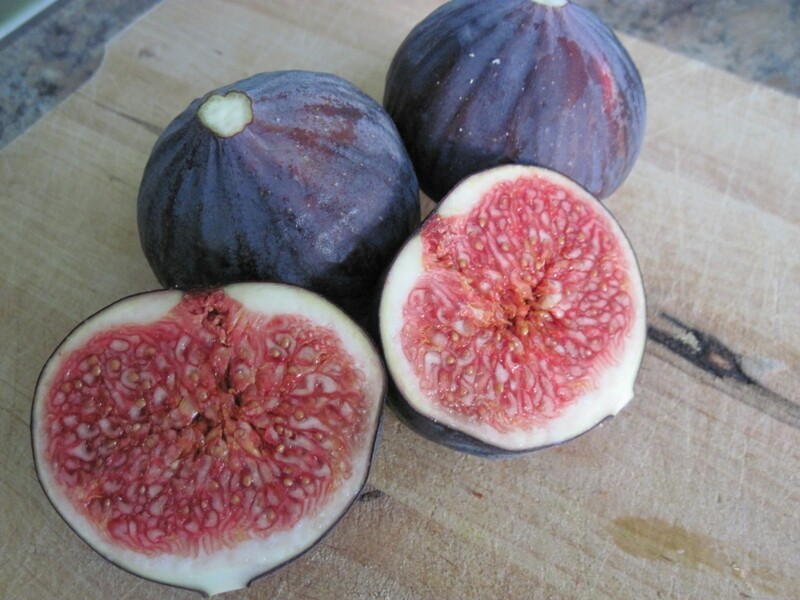 ON THE MENU TONIGHT: Smoked Salmon tartlets with a Parmesan crust; Pan-fried Pork Chops with Pepper Relish & Celeriac Mash; Baked Figs with Cinnamon & Honey. Now then, this is a good one. By good, I mean cheap, tasty, easy and impressive looking. Good with a capital G. It’s a good old Gordon recipe, taken from his Ultimate Cookery Course book, and it’s just fabulous. We haven’t eaten pork chops for years. I don’t know why, because they’re really yummy and are pretty economical. But these ones were even more economical than usual because I found them in the bargain bin at Morrisons – just £3 for the two. Add one of those mixed bags of peppers, a couple of onions and a celeriac (my new favourite vegetable) and you’re all in for just over a fiver. AlphaMale spent the entire meal cooing over the fact that he had an ‘actual pork chop’ on his plate, and reminiscing over pork chops from days gone by. If you can put up with that kind of conversation, this is definitely the dinner for you. 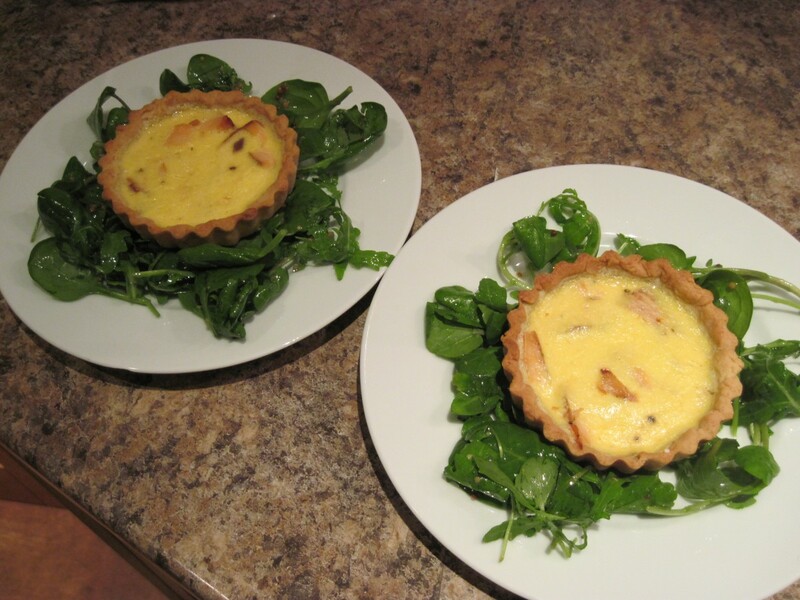 Smoked Salmon Tartlets with Parmesan Crust. If you are a regular reader, you will know that these are a tried and tested favourite of ours, and I usually pull them out of the freezer when I have nothing else in mind. For those of you who haven’t yet sampled them, the recipe can be found on the Dinner a Deux 1 page. 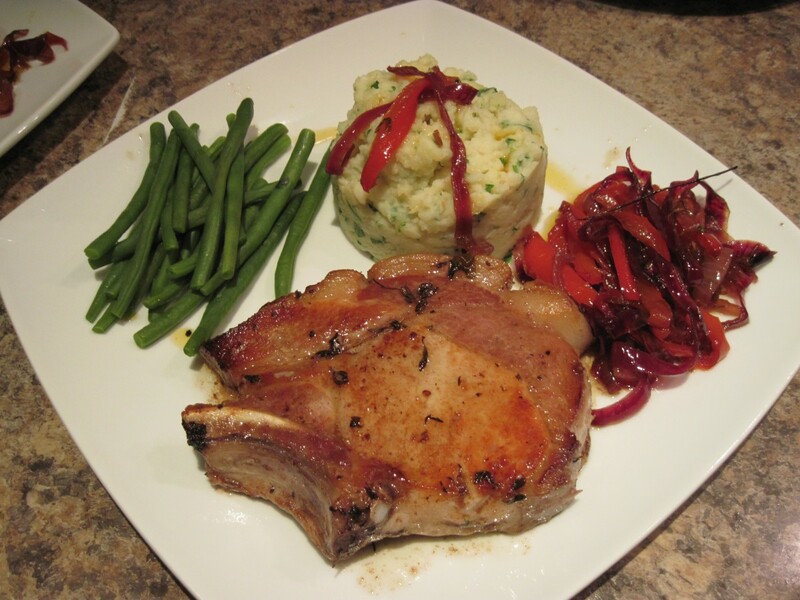 Pan-fried Pork Chops with Pepper Relish & Celeriac Mash. This has been adapted very slightly from Gordon’s recipe, but is pretty much the same. Heat a little olive oil in a large frying pan and add the onion and peppers. Season well, add the sugar and fry for 4-5 minutes over a high heat, keeping them moving to prevent burning. Make sure they are sizzling, to ensure they are frying, not steaming in their own juices – you want to create a nice caramel sort of flavour. Add the red wine vinegar and allow it to bubble and reduce for about five minutes. This allows the flavour to develop and not be too, erm, vinegary. Turn down the heat and add the extra virgin olive oil. Cook for a further five minutes until the peppers are soft. Remove from the heat, stir in the basil, pour into a bowl and leave until you are ready to serve. I tend to reheat it for this recipe, but it is just as nice cold. Wipe out the pan ready for the chops. Score the rind on the pork chops at 3-4cm intervals, making sure you don’t cut the meat. This stops the chops curling up in the pan. Season well. Heat the frying pan until really hot and add a tbsp of olive oil. Carefully place the chops in the pan, along with the garlic and thyme sprigs and fry for 2-3 minutes until nicely coloured. Turn and repeat on the other side, pushing the thyme and garlic under the chops. Press the chops down well into the pan to ensure they go really golden. Towards the end of the cooking time add 3 large knobs of butter to the pan and use to baste the chops. Push the chops towards the back of the pan as you tilt it, to allow the rind to cook well. Transfer the chops to a warm plate and rest for 5-10 minutes, basting with the butter every now and then. Place the celeriac and garlic in a pan, cover with water and add a pinch of salt. Bring to the boil then simmer gently until soft. Using a stick blender, make a puree from the cooked vegetables, pouring in a little of the milk to give a smooth consistency. Add the spices, cream and butter, then whizz again. Stir through the parsley, season to taste and serve. 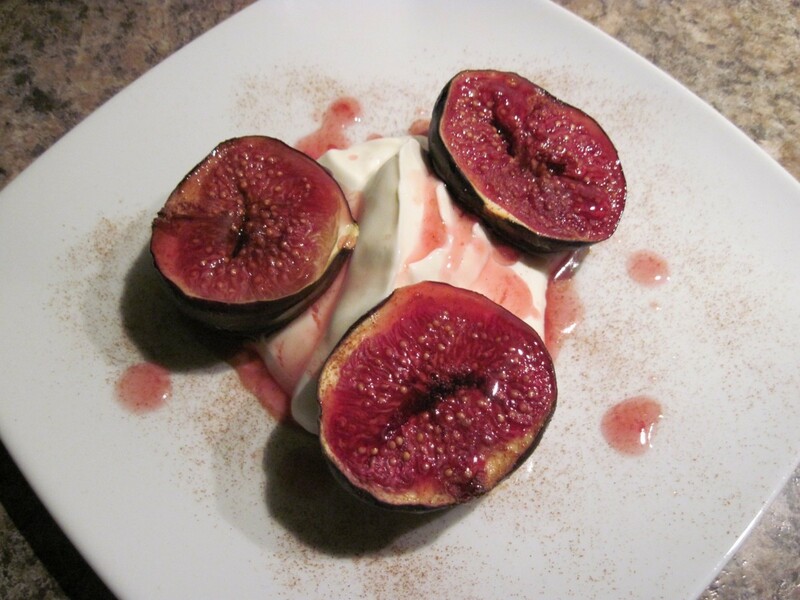 As I’ve said before, figs are plentiful at this time of the year and are really reasonable. Add a couple of store-cupboard ingredients and a blob of creme fraiche and you’ve got yourself a mouth-watering, simple dessert. The recipe for these can also be found on my Dinner a Deux 1 page.